Fill the crock pot to within an inch of full with applesauce. Add 2 tbsp. ground cinnamon, 1 tsp. ground cloves, 1/2 tsp. allspice, 2 cups sugar. 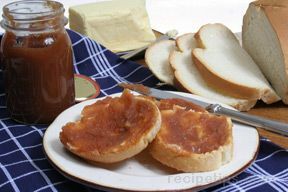 Cook the apple butter on low or medium heat (I use low). Cover it loosely or use a large pot splatter guard. It will spatter as it boils slowly, so I also cover nearby surfaces with towels. You don't want to seal it tightly because you want the steam to escape so it can reduce in volume and thicken. Leave it to cook for 6-12 hours. How long depends on the size and power of your crockpot, and how thick you like it. If you want to stir it occasionally, that's fine but not necessary. I let mine go overnight. It will reduce in volume by about half overnight. 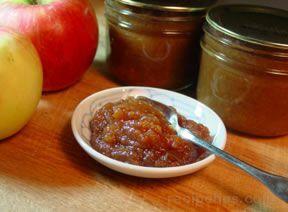 As it cooks down (the next morning), add the remaining applesauce (about 2 or 3 quarts) and 2 more cups of sugar. Then let it cook a couple of hours more to mix the flavors. 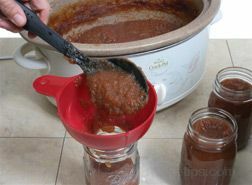 Wash your jars and lids and fill to within 1/4 inch of the top, wipe any spilled applebutter off the top and seat the lid and tighten the ring around them. Put sealed jars in a canner and process about 15 minutes.